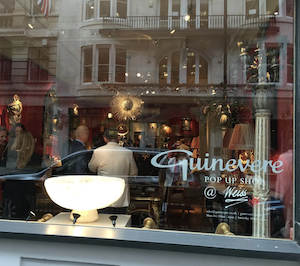 Red-eye from Los Angeles and noon touchdown at Heathrow the 28th of July, cab it into Fulham, shower, and make myself ready for the opening party of the Guinevere Pop Up Shop at Weiss Gallery in Jermyn Street. I have flown in from LA to work at the Pop Up for the six weeks it will be open. ‘Pop Up Shop’ sounds a tad casual for what I find when I get there. The gallery, styled by Guinevere’s resident designer, Dean Robinson, is looking gorgeous and luxe. Furniture, lighting and accessories are mixed together with specially selected paintings from the Weiss collection. The look is sumptuous, gold, red and ebony feature in the main room, and cream, soft green and gold in the long gallery. A crowd soon gathers, enjoying the hors d’oeuvres by the Imperial, the champagne, and, I notice, especially the Tom Collins with blood orange! My favourite pieces from Guinevere are a pair of bronze statues of Atlas standing on plinths inscribed with quotations from Pliny the Elder’s Natural History. One figure is holding up the planetary system, and the plinth is inscribed: ERRATIUM MOTVS LVMINVM CANONICA (The motions of the Planets and the General Law of their Aspects) Volume 1, chapter 12. The other figure is holding up the planet Earth, with the inscription below: MEDIAM ESSE MVNDI TERRAM (That the Earth is in the Middle of the World) Volume 2, chapter 69. 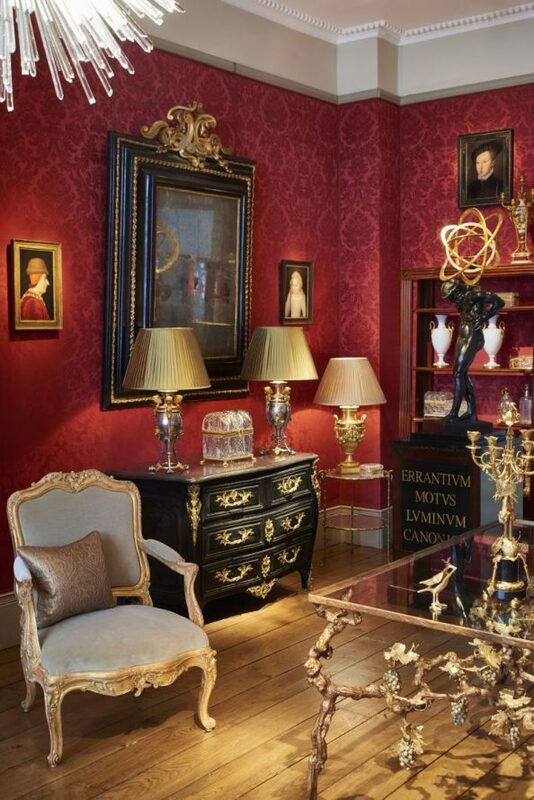 My elegant Louis XV style desk here at the Pop Up is directly opposite a portrait of a Dutch lady who looks incredibly like Frances McDormand (the actress from Fargo). This lady is in formal court dress, a stunning black and gold gown, delicate lace at her neck and cuffs, ropes of pearls and a massive brooch on her bosom. Somehow I can’t see Frances in this outfit, but here she is, every day, keeping her counsel!